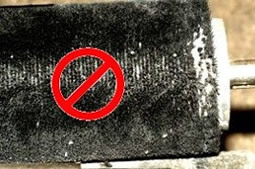 Friction in a cleaning application is a major factor in creating static. Cleaning parts with a rotating brush can be been a sure way to increase static charge. Static charges build up on both the brush and the finished product ultimately clogging the brush and re-depositing loose particles on the end product. 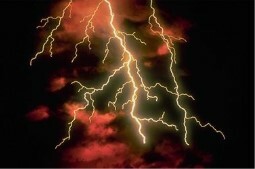 Static charges also create unsafe environments where a spark can start a fire or explosion in a dust collection system. 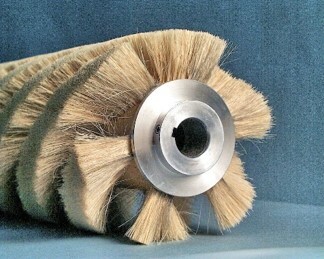 Many brush manufactures and OEM machine builders use natural fiber, such as Tampico, Horsehair, and Boars Hair to minimize static build up caused by cleaning with a rotary brush. The problem is that the range of stiffness available with natural fibers is limited. Natural fibers are also brittle and do not last as long as synthetic fibers. 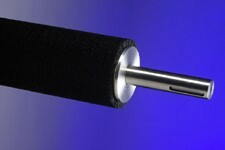 Industrial Brush Company has develop a line of Conductive Nylon and Anti Static Nylon cleaning brushes. They range from brushes that are truly static dissipaters to brushes that are static neutral. Loose particles can effectively be brushed off the surface of a part and vacuumed away in a dust collector. Re-depositing contaminate on the part and clogging of the brush is eliminated. 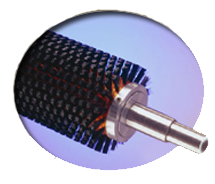 Conductive Nylon and Anti Static Nylon is available in a variety of sizes ranging from .010” to .020” allowing Industrial Brush to match brush stiffness with particle size of your contaminate. Bristle stiffness and brush density can also be varied to suit the shape of the part you are cleaning. Do you have a static problem that is frustrating you in your cleaning operation? Are your natural fibers brushes breaking off and causing more problems than they are solving? We encourage you to contact us for further information and to discuss your specific application. Conductive Nylon or Anti Static Nylon brushes from Industrial Brush Company could be a real breakthrough in helping you clean your product. 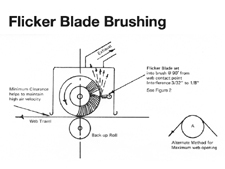 Take a look at our Flicker Blade brushing illustration to help keep your brush free of contaminate.